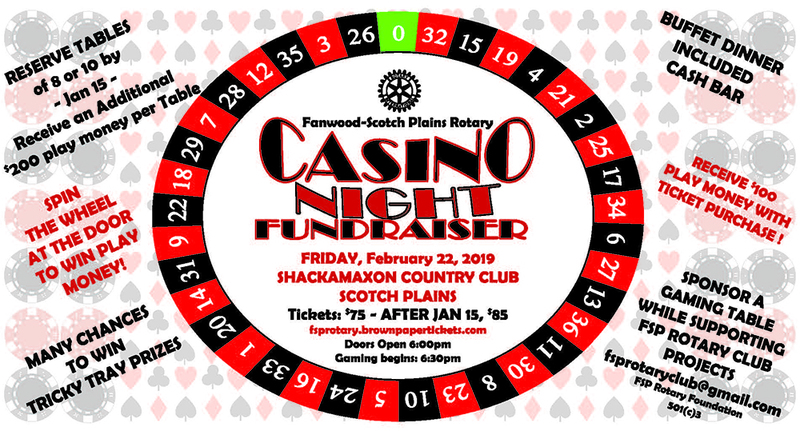 The Fanwood-Scotch Plains Rotary Club will hold their Casino Night Fundraiser on Friday, February 22, 2019 at 6:00 p.m. at Shackamaxon Country Club in Scotch Plains. Tickets are $85 per person and include a buffet dinner and $100 in casino play money. Doors will open at 6:00 p.m. and gaming begins at 6:30 p.m. All attendees must be at least 21 years of age. Tickets and sponsorships can be purchased at fsprotary.brownpapertickets.com. For further information about the event, including sponsorship opportunities, contact FSPRotaryClub@gmail.com. There are a limited number of tickets available and the event was sold-out last year. Everyone is encouraged to purchase their tickets early! The fundraiser will support the many charitable activities managed by the Fanwood-Scotch Plains Rotary Club, a thriving organization with 70 members. The club currently sponsors local and international causes, as well as scholarships for Fanwood-Scotch Plains High School students. The Fanwood-Scotch Plains Rotary Club has been serving the community since 1938. Meetings are held on Wednesdays at noon at the Stage House Restaurant. On the last Wednesday of the month, members can participate in a service project for Mobile Meals of Westfield and/or attend a friendship lunch. Guests are invited to attend and learn about the good that Rotary is doing worldwide. For further information, go to fsprotary.org.